The notion of circulating black wealth within the black community is nothing new. It’s simply black capitalism – a way to build wealth in the black community by encouraging black people to spend their money with black entrepreneurs and businesses. It was encouraged by leaders such as Booker T. Washington and Marcus Garvey. 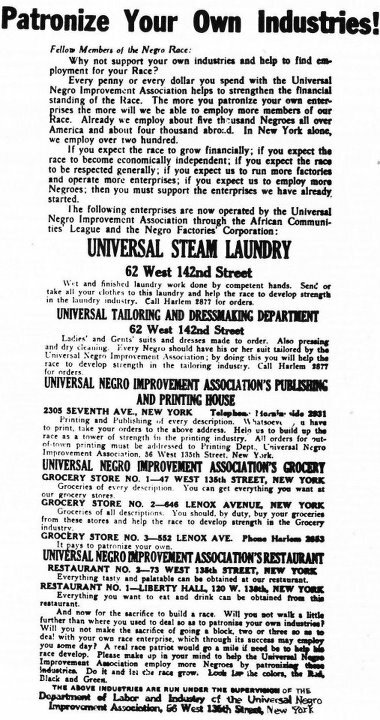 Garvey believed economic success was the quickest and most effective way to independence. He even purchased ads in local newspapers during the early 1900s to encourage the practice. Because of higher than the norm poverty and unemployment levels among African-American and many high-profile police-shootings of black men, several new-age activists are resurfacing the notion to push the movement forward as a form of economic protest. The advocacy action has gained the attention of French news outlet France 24. The media outlet recently covered WeBuyBlack.com founder Sharif Abdul-Malik and the Buy Black movement spreading across the United States. The call to action comes at a time when the spending power in the black community is increasing faster than in any other minority group, but is not being spent within the community. In a digital age, WeBuyBlack.com helps advance the concept by meeting the need for an online marketplace for black-owned businesses to showcase and sell their products to a global community. Entrepreneurs use the WeBuyBlack website to sell their products. Thousands of shoppers support entrepreneurs to effect social change and buy their products. France 24 spoke with rapper and activist Killer Mike, author Boyce Watkins, True Laundry Detergent creator Ali Muhammad, and Abdul-Malik. “It just proves that what we are doing has a major impact,” Abdul-Malik said of the international news coverage. Abdul-Malik created the online platform that sells everything from toilet paper to skin lotion, all produced by black-owned companies. The 24-year-old change maker says his work will have a similar impact on future generations of African-Americans. The movement to #BuyBlack and #BankBlack has been advancing with the help of celebrities and it continues to pick up steam.